FAQ: What Is Social Advertising & How Does It Impact My Sales? You’ve asked the right questions: What is Social Advertising? How does social advertising impact sales? Will it help me get the right ROI on my digital marketing budget? It’s time to get the answers. Read on to find out! By 2020 digital marketing researchers expect US businesses to spend over $100 billion on digital ads per year. Today, over 35% of display ads are run on Facebook. Other social media ad sites and search ads like AdWords collectively make up the difference. What’s driving the social advertising industry? It’s the impact of social media ads on small business sales revenues. Are you still a little fuzzy when asked what is social adverting? You’re not alone. Do you find yourself wondering if you’re already doing it? You have a business profile on Instagram and Facebook. Is that it? Is there more? Let’s clear it up. It’s really simple. Social advertising is any advertising in which you’re paying the social media company to display your content. It could be a display ad, a promoted tweet or other showcasing of your profile, products or services. It may be a one-off promotion or it may be a strategic, full-scale campaign. The latter is how our clients see dramatic revenue increases that are worth their investment. What Are Your Social Advertising Goals? What is social advertising in terms of goals? Let’s take a look. Social ads can be used in many specific ways to meet different goals. They can help you target people in very specific demographics who might not otherwise stumble across your profile or website. Increase visibility on social media through these ads. That’s especially important if you have a very small following and trouble gaining traction. Through paid advertising, engage more people to generate buzz around your business. Use ads to increase site traffic, shares and/or leads that you can nurture into sales. Design your ads to provide information that people need when they’re considering one brand over another. Social advertising can also be very effective for that quick sale. Click> Add to cart> Checkout > Done. Once you have a new customer, an ad can be just the reminder they need to return and buy more. As you can see, social advertising works for goals you might set throughout the buyer’s journey. It works from getting a stranger’s attention to earning a repeat customer. Establish your goals, align your ad with that goal and start getting results. What Is Social Advertising; Do You Need a Profile? You can create ads without putting much effort into your profile. In fact, in Facebook, you can create some types of ads without having a business profile at all. But really? What is social advertising without a profile? It’s sort of hollow. A strong social media profile will help you make a more lasting impression. It can reduce social advertising cost over time as you’re able to engage more people in a more social way by sharing posts, stories, updates and pins. What Are the Best Platforms for Social Advertising? Generalized data like this is helpful. But it’s important to realize that it applies to most businesses. If you only think of Facebook ads, then it may be time to rethink. What is social advertising to you? While Facebook does lead the way, you may find more success on another platform where you’ve built a following. Your customers may be more receptive on a certain platform. It pays to look more closely at the different platforms to make a smart choice on where to spend ad dollars. For example, a study showed that Millennials who use Pinterest spend on average 43% more on specialty foods and ingredients than millennials who don’t use Pinterest. The study also found that pinners more frequently update their home decors and wardrobes. Overwhelmingly, people across age ranges use Pinterest to shop for things that catch their eye. This could make Pinterest the best place for your ads. If your brand is very visual, then advertising on Instagram may drive the most sales. 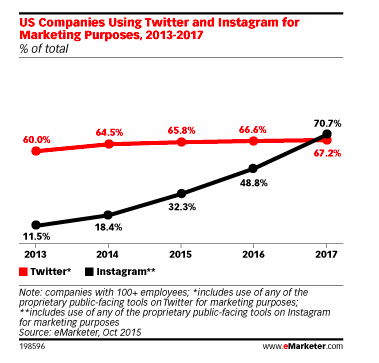 As Twitter remains steady but flat, Instagram is on the rise. 65% of the top performing stories on Instagram were related to a specific product. Consider your customer base and how people on various sites relate to your industry to spend your ad dollars in the most effective place. What Is Social Advertising vs. Other Methods? To see how social advertising works within a comprehensive marketing strategy, let’s compare it to other common marketing methods. Let’s take a look at social advertising vs SEO and content marketing. Effective social advertising delivers the faster ROI. SEO and content marketing are important for long-term success and sustainable growth. They both enhance the power of all other marketing methods you choose. And they deliver the higher ROI over time. But in small business, it’s not uncommon to need to drive sales now. Social advertising is the way to do it. As long as you continue running your ads, sales will stay relatively stable. Compare this to the volatility of Influencer marketing. In influencer marketing someone who your target audience respects shares something about your brand. You most often pay for this share as a form of paid endorsement. It can cause a sudden and sometimes unmanageable spike in sales. Think Oprah Effect or SharkTank Effect. You may try to plan for that huge rush of orders. But sometimes it doesn’t work like you planned. Influencer marketing can be an amazing tool to drive brand awareness. But its unpredictability must be managed carefully. What is social advertising compared to influencer marketing? It’s more steady and dependable. It’s easier to manage new orders and appointments because they arrive more consistently. There are definitely some things you need to learn to make the most out of your social advertising budget. But compared to something like AdWords, planning and running ad campaigns is a piece of cake. In AdWords, you need a solid keyword strategy which includes doing extensive keyword research and analysis to determine which words will attract the right audience. Then create an ad to send them the right message. You have to stay hyper-focused on your quality score, which determines how much you pay for ads. The campaign needs constant attention to make sure your keywords are performing as you intended. When you create a social advertising campaign, part of your ad spend is paying for access to this valuable data that you as a small business may not have had the opportunity to collect. Select the categories that represent your target. Create an ad that sends a message that this audience will find compelling. Earn that click that you can then convert to a lead or sale on your website. If you’re an AdWords pro, it’s a great tool to drive traffic to your site. Over 50% of website traffic comes in straight from search results. It has a fast ROI. And it can deliver some very steady results. But if you’re not a marketing expert, social ads will be much easier to learn and apply. Your ROI on pay-per-click advertising methods like social ads are easier to measure. A person clicks. They buy something. You attribute that sale to that ad. Methods like content marketing are harder to measure. It has more indirect yet meaningful impacts on sales. With the help of SEO, it increases brand awareness, visibility and trust. These influence more people to click your ads. And it will lower your advertising costs over time. But sometimes it’s hard to attribute a sale back to a specific piece of content. Social advertising also impacts sales in ways that are difficult to measure. We’ll discuss that further as we look into the specifics of how social ads drive sales. How Do Social Ads Influence Brand Awareness? Brand awareness needs to do 3 things to be successful. First, it’s simply increasing the number of people who know who you are. They recognize slogans, fonts, colors or images associated with your brand. When they see your brand, they recognize it even if it’s not in its usual setting. Second, it’s creating this awareness among your target. If you’re creating a ton of awareness among people who aren’t potential customers, it won’t do you a lot of good. Third, it’s creating a distinct perception of your brand. That’s the brand that cares about the planet. That’s the brand that everyone at school wants. That’s the brand that doesn’t sacrifice quality. With these perceptions, a person ties an emotion like feelings of happiness, peace, safety or belonging. You can tap into the emotion that your branding evokes to get people to take specific actions like liking, clicking, double-tapping, tagging, commenting or mentioning. Brand awareness also goes through 3 distinct stages. Here they are and how we measure them. Increased visibility and interactions. Measure it in impressions, shares, comments, etc. Positive sentiment. Measure it by the number of positive mentions and reviews. And look at how many leads your brand awareness is generating. It’s this positive sentiment that drives sales. But you have to get there first by clearing stages one and two. What is social advertising if not one of the best brand awareness tools out there. If you were going to run a promotion at an event, wouldn’t you ask how many people would be there? If you were going to pay for an ad spot on a TV show, you’d want to know the viewership. Over 81% of people in the US have at least 1 social media profile. 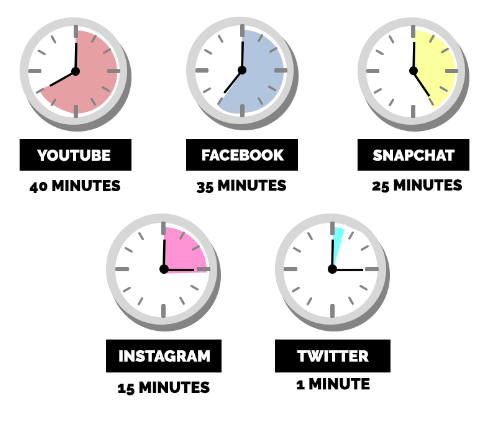 The average person will spend over 5 years of their lifetime on social media. Adweek reports the following daily breakdown for the average person. The average 12-18 year old spends around 9 hours on social media per day. This sounds outrageous to those of us over 30. But for these future customers, social media has become so integrated into their lives that it’s hard to separate the two. Social media ads reach people where they spend their down time and sometimes work and school time as well. Play your cards right and it will significantly impact sales. When you make a sale, you may think that that this customer is new to your brand. But chances are that they’re not new at all. Research shows that it takes up to 13 touches with a brand before a person becomes a customer. When someone finally fills their cart and heads to check out they’ve already been aware of you for some time. It could be days. It could be months. What determines how long it takes? It’s no secret. The faster you take a target customer through 13 touch points, the faster you can make a sale. Fortunately, we’re not talking about 13 clicks you have to pay for. When you make ads that are very identifiable as your brand and get the attention of your target audience over and over, your touch points are adding up. Add to this any viewing of posts from your brand, mentions of your brand by others and appearance in search results. Touch points can add up fast. The simple non-invasive, consistent and compelling repetition helps you make that sale. On average, companies that effectively use social media advertising to generate brand awareness will increase their sales by 23%. A 23% increase in sales. That’s great. But something else happens on the other side of things that makes those sales even more lucrative. Because you’ve built brand awareness, more people are going to your website on their own. They’re more likely to click on you when you come up in search. When they see your name on a review site like Yelp, you’re “the name they know”. They even think about your brand out of the blue when they need something you offer. As this brand awareness grows you have more customers coming in through lower cost channels. These include social media posts and videos, your blog, search results, referrals and direct traffic. If you want to measure the real ROI of social media advertising, it comes in these not so easy to measure benefits that pay you back over time. What is social advertising again? It’s an amazing tool for building this kind of brand awareness. How Does It Improve Product Accessibility? Social media puts your target customer one click away from a sale at the perfect time. 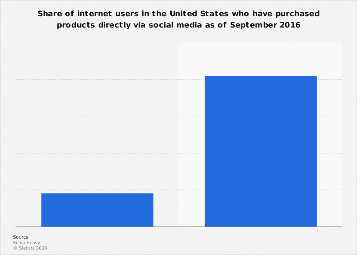 Statista, a consumer behavior research firm, found that 81% of social media users make purchases straight from social media. The average order size is $102. What did you pay for that click again? To reinforce this point, 55% of Pinterest users say they’re number 1 reason for using Pinterest is to shop. Why do so many people buy things straight through social media? It’s instant gratification. Like few other channels, social media allows you to go from seeing a product to learning about it to buying it within minutes. Visiting your website simply feels like a continuation of the social media experience. Compare this to a TV ad. You have to stop watching TV. Get in the car. Go somewhere. Or you have to wait for a break in the programming. Then try to remember the website address so you can find it on your phone. Oops, you forgot the address. Oh well, you really didn’t want it anyway. Or so you tell yourself. Within seconds you’ve forgotten about it. When you remove the barriers between your customer and your product, you make the sale. How Does It Increase Word-of-Mouth? One of the reason’s social media is such a powerhouse is because it can be so many things to so many people. It’s where you spend your leisure time. It’s where you learn about brands. It’s where you stay informed about events and issues. It where you see what your friends are up to. It’s where you share your experiences. And overwhelmingly, our experiences are interactions with brands. When you produce social media ads that people love, they feel compelled to share them. They may not even be familiar with your brand yet. Word-of-mouth drives over $6 trillion in sales each year. People are 90% more likely to buy something if it was recommended by a friend. And it doesn’t even have to be a close friend. Word-of-mouth drives 5X the sales of a paid ad alone. Create an ad that is very shareable. And you increase your reach exponentially. What is social advertising if not the modern way to get people talking about your brand? And you don’t even have to create an obnoxious jingle. How Does It Help You Scale Quickly? As mentioned before, marketing methods like trying to increase visibility through SEO and content marketing take time to build momentum. They then pay you back over time. Building a social media presence without advertising can be exhausting and take forever. You could be waiting a very long time. Social media advertising is the boost a business needs to scale quickly. Do you have a new product to release? Is your Facebook profile sitting there with 3 followers, who happen to also be your employees? Or maybe you’re just not getting the engagement you need to drive sales. Get people excited about what’s new at your brand. Earn followers who you continue to nurture and convert without the ad cost. Are you unsure about social media advertising and don’t what to waste money doing it the “wrong way”? Then start small. As your confidence grows, scale your efforts easily. Get your ads in front of a whole new group of people. How Does It Improve Brand Loyalty? How do loyal customers impact sales? If you increase customer retention by just 5%, profits rise by 95%. You’re around 50-60% more likely to sell something to an existing customer than a new one. Existing customers who buy again spend 67% more than a new customer. They once said that it costs 5X more to acquire a customer than to keep one. With inflation and increased marketing costs, experts now say 7X more is a more accurate representation. That really cuts into your marketing ROI. Customer loyalty does exist. And it’s valuable. With consistent social advertising that’s backed by a great website and social media profile, you can build this kind of loyalty. 53% of people who follow a brand on social media are exclusively loyal to that brand. Given the value of loyalty, we’d have to ask what is social advertising good for if it doesn’t further your pursuit of brand loyalty? Loyalty pays you back again and again without the ongoing acquisition costs. How Does it Make Conversions Easier? Social media lead-to-conversion rates are twice that of outbound methods like interrupting a video to show an ad. Even if you’re showing ads, social media just seems more human. People feel less bombarded. So their guards aren’t up. You can attribute this conversion rate to that aspect of the platform. In addition, social ads are consistent and persistent. But most people don’t consider them annoying. This “annoying factor” goes way down thanks to the data-collection efforts of social media platforms. Through this data, they’re able to show people ads that are highly relevant to them. You’d be amazed how much you can learn about your target customers through a social media advertising campaign. Also, keep in mind, during the ad-setup process you get to choose the specific audience that sees your ads. Apply what you learn to optimize your social advertising strategies and better align your website and social media profiles with your campaigns. This will extend beyond social media. You can apply it to your SEO strategies, AdWords, Content and beyond. What is social advertising? It’s how your business can increase sales while cutting costs at the same time. It’s how to reach people in a way that they prefer and build loyalty that will continue to pay you back. Are you struggling to increase sales through digital marketing methods like this one? Find out how our social media marketing agency can help you grow your business and continue to teach you more about what is social advertising. Contact us today.